Sailing Yacht A a “sail-assisted motor yacht” 142m the World’s Largest Sail yacht. The keel incorporates one of the largest single pieces of curved glass ever made, measuring 193 square feet and weighing 1.8 tonn. The glass is used to create an observation pod on the bottom of the vessel in part of the keel known as the skeg, where it extends backwards towards the rudder. Sailing Yacht A a “sail-assisted motor yacht” the World&#8217;s Largest Sail yacht. Doyle Sails in the USA. Observation pod on the bottom of the vessel. 24 shell doors in the hull. Touch Sensitive Black Glass.The windows, which are all oval, look small from a distance, but all have a magnifying effect, making them seem huge from the inside.One-way film to cover the exterior of the glass for privacy and to blend them into the custom metallic paint finish by Alexseal. Touch-and-go helipad on the bow. The mainmast towers 100 metres above the waterline The masts are curved. The masts can withstand 90 knots of wind with full sail up (equivalent to a Category 2 hurricane). Total sail area of 3,747 m2 is equal to the size of half a football pitch. The sails, by Doyle Sailmakers of the US, are a combination of carbon and Technora fibres and covered with taffeta to protect them from UV. 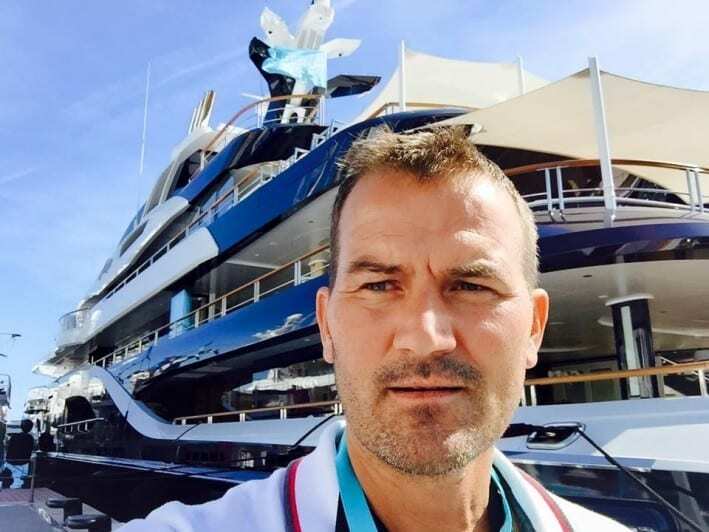 Andrey Melnichenko, the Russian billionaire and businessman, is set to rule the seas after building the world&#8217;s largest luxury sailing yacht. The vessel, which cost Mr Melnichenko €400 million (£292 million or $451 million) to build, is one of the most advanced yachts of its kind. Mr Melnichenko, men, is expected to recover some of the costs by licensing the technology developed for the vessel for commercial applications. Du har sett bilder,,en,nå er hun i live,,en,@nobiskrugsuperyachts kom opp med en kontroversiell design, men jeg elsker det,,en,Crazy å kunne se en så unik design fra sofaen,,en,Jeg kan bare ikke bli vant til det ellers vil jeg være trist når hun går.,,en,Atropatesis,,en, now she’s alive. @nobiskrugsuperyachts came up with a controversial design but I’m loving it. Crazy being able to see such a unique design from the couch! I just can’t get used to it otherwise I’ll be sad when she leaves..